Korina Sanchez and twins Pepe and Pilar reunite with Daddy Mar Roxas in Manila. Pepe and Pilar are home. After residing in Pennyslvania for nearly two months, Korina Sanchez has brought her twin kids to the Philippines. The broadcast journalist and her children receive a warm welcome in their Quezon City home, with senatorial candidate Mar Roxas leading the welcoming committee. Korina posts a glimpse of the twins' reunion with their dad. She captions, "After a major production of flying twin babies 20 hours away, we are finally home! "Came back with a nice get together to meet Pepe and Pilar." The Rated K host and her kids began their journey to the Philippines on April 1 (Manila time). Here's their photo inside the plane during their ride home. "Pauwi na sa wakas!!!" she writes. "Si Pepe need lang ilakad para tumahimik. Demanding for milk si little boy. "Si Pilar was perfectly well behaved and ladylike. Love them both. Excited na si Lola, sasalubong!" 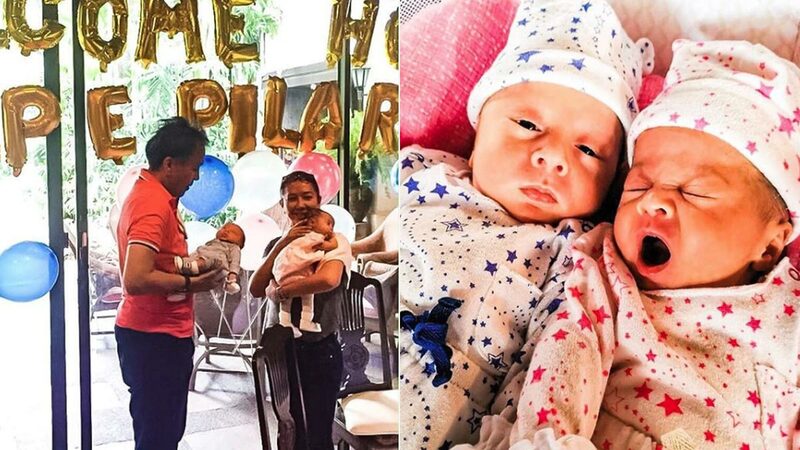 Korina Sanchez and Mar Roxas introduced twins Pepe and Pilar to the public via Instagram in February.